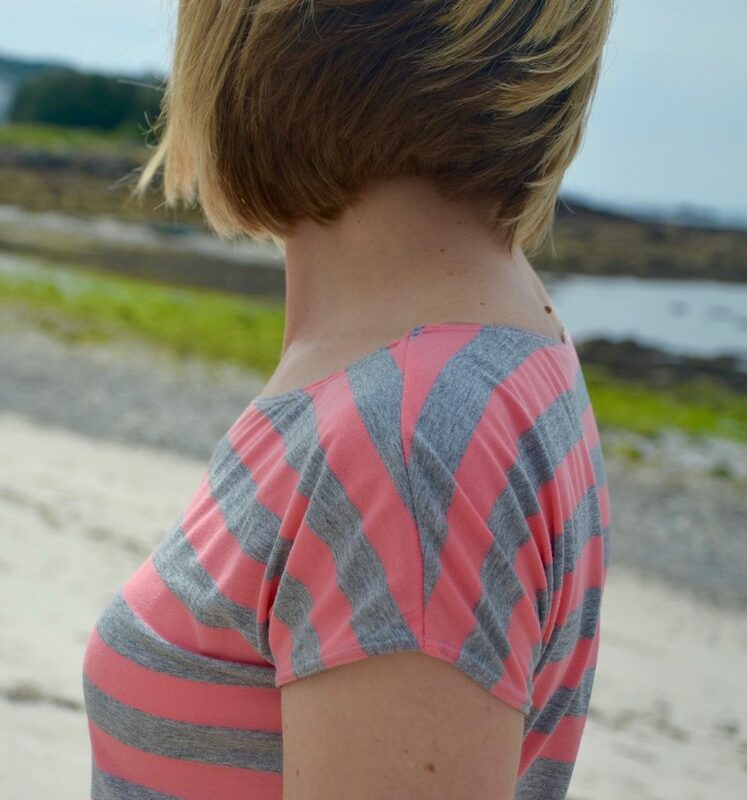 I love my jersey clothes soooo much – they are so much more comfortable than woven fabrics (which definitely have their role to play too in my wardrobe nevertheless!). For the Summer I had visions of a jersey maxi dress that would be easy to throw on, cool in the heat and really comfy to wear on holiday. I searched for ages trying to find the right pattern but really struggled. I bought the fabric before I found the pattern so bought 3m of it and hoped for the best. 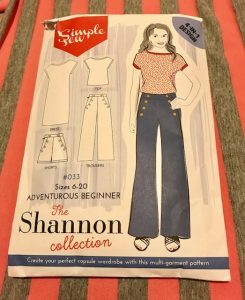 Whilst looking through my pattern stash I found the Simple Sew Shannon collection pattern. 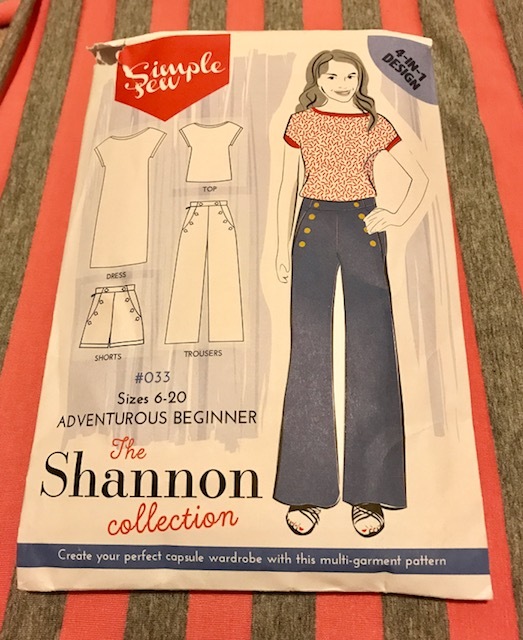 The pattern came free with a copy of Love Sewing magazine and the collection consists of a top, dress, shorts and trousers. The dress is described as a staple t-shirt dress which is what I was after but was too short. 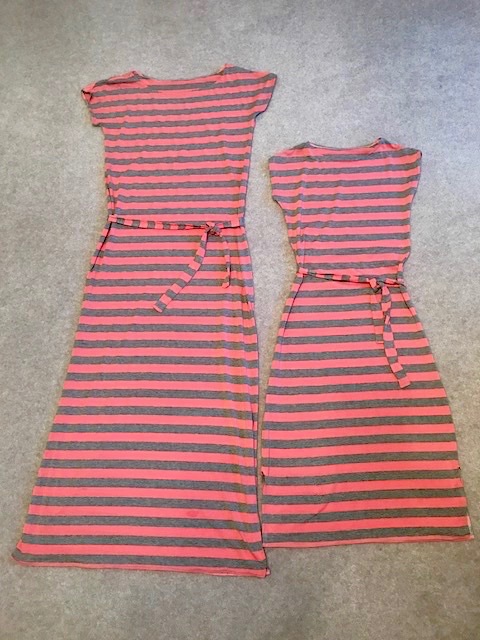 It was so close to what I wanted though that I thought that I could have a go at lengthening the whole dress to maxi length, adding slits up the side and making a waist tie. So that’s what i did! 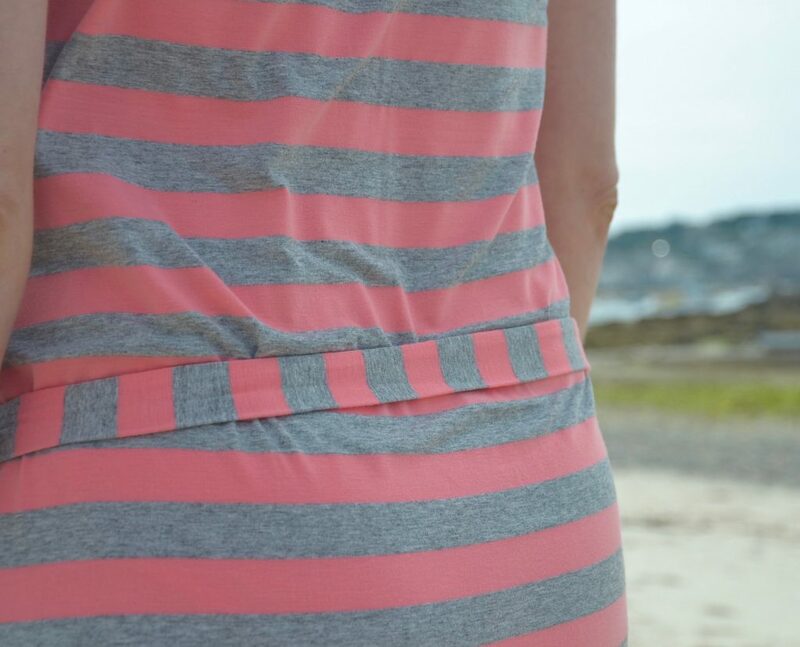 The fabric is a pink/grey striped light-medium weight jersey from Barry’s fabrics in Birmingham (oh how I love that place!!). 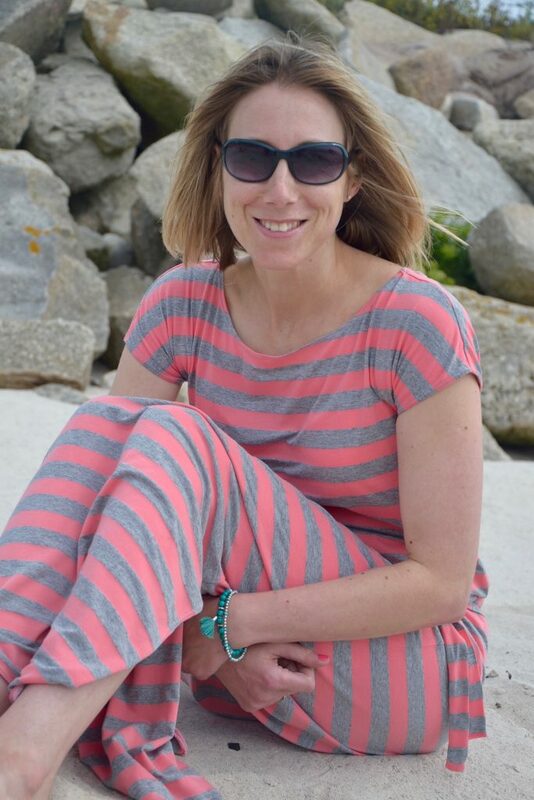 I loved the colour combination and thought the stripes would work really well for a maxi dress. My body measurements were coming up as close to a size 8 when compared to the finished measurements chart on the back of the envelope. I cut a size 10 to allow for some ease. 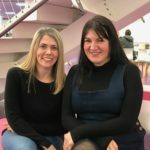 What I didn’t realise at the time but since have discovered that the body sizing chart which I couldn’t find on the pattern envelope or pattern itself is actually on the website. You can find it here. Without this information at the time I was unable to work out how much ease was included in the pattern. So I cut a size 10 and thought it would be easy enough to take in at the side seams if needed. I also made a note that the pattern includes a 1cm seam allowance, not 1.5cm like in a lot of patterns so I had to remember this! I lengthened the dress at the hem by 19″. I did this after I laid out the fabric and pinned the front and back pattern pieces in place. I then basically cut the fabric in a straight line down from the original hemline. I then worked out how long I wanted the side splits to be and marked that on the fabric pieces. 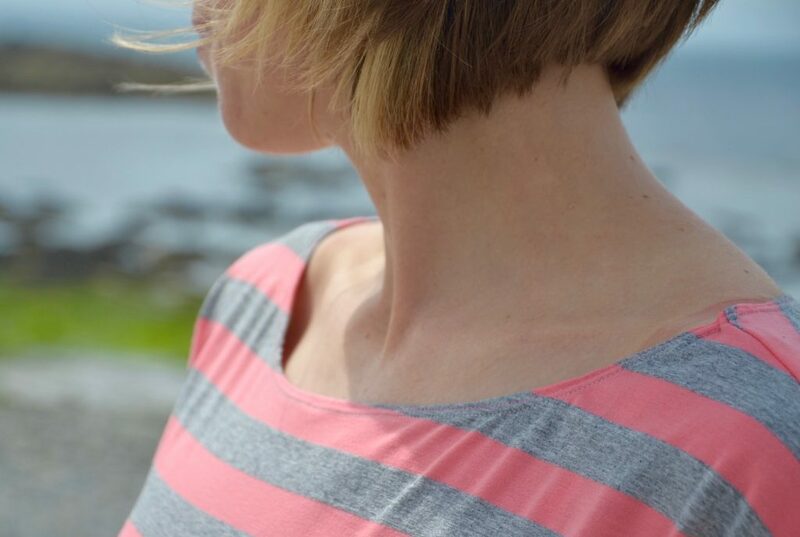 The pattern has separate neck and sleeve binding pieces. I made the neck binding and attached it but it just didn’t lie flat and would have needed redrafing in order to sort. I didn’t really have the time or the inclination to do this (!!) so instead just finished the neckline and sleeves off by overlocking the raw edges and turning over a 1cm fold. I then used a twin needle to topstitch round the edge. 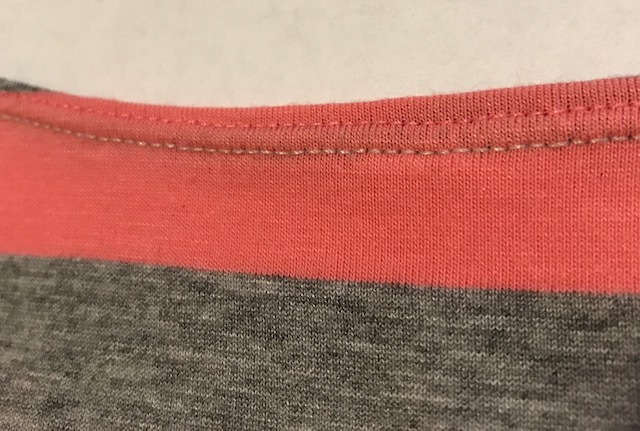 I used one thread of grey and one thread of pink throughout all of the topstitching which I think looks cool, the way the pick shows up on the grey and vice versa! 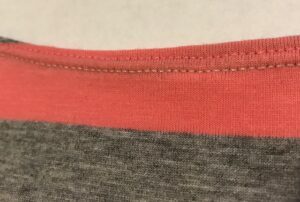 I also used stretch interfacing along the edges of the neckline, sleeve edges, edges of the side slits and hem in order to stablise them and prevent them stretching out of shape. I constructed the majority of the dress using the overlocker so was really quick. It would also be easily made using a standard sewing machine but would be useful to use a walking foot to help manage the stretch fabric. 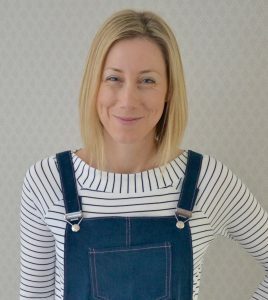 No separate sleeves to set in – the dress features ‘grown on’ sleeves so it only involves the 2 main pattern pieces – front and back dress – nice and easy! The belt I made using an awesome tutorial by Lucy from Sewessential. You can see the video tutorial here. 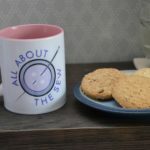 It’s such an easy technique using the overlocker as making straps and then turning the right way out can be an absolute nightmare – check the video out!! 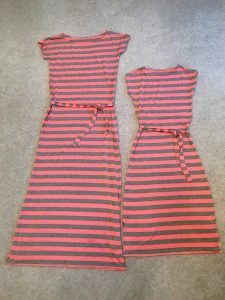 I cut the belt pieces out of the fabric on the opposite grain to the main dress so that the stripes run at 90 degrees and stand out more. And finally – this is how my new dress makes me feel….happy! Totally worth it! The only problem then was that a certain little person wanted EXACTLY the same dress. Well I did have enough fabric left over….so how could I refuse?! I self drafted this using an existing t-shirt to copy the size and neckline shape and followed the same principles as my version for the rest of the dress. Really pleased with how it turned out. 2 rules – they will not be worn together other than for comedy purposes and I get to choose when to wear mine first!!!!! 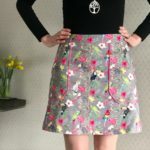 I would totally recommend this pattern for a relatively quick and straightforward sew and I hope to repeat it at some point, probably next Summer now!